NASA has delayed the launch of its new James Webb Space Telescope until no earlier than May 2020 due to the need for more testing. This article was updated at 1:15 p.m. EDT with additional details from a NASA news conference. NASA has delayed the launch of its next great space observatory, the James Webb Space Telescope, until no earlier than May 2020 — nearly a year later than planned — due to the need for more testing of the telescope's intricate systems and setbacks, including tears in the tennis-court-size sun shield, the space agency announced today (March 27). Because of the launch delay, the telescope's $8.8 billion price tag could rise, too, NASA officials told reporters today. Billed as the successor to the Hubble Space Telescope, the new space telescope is an infrared observatory designed to peer deep into the universe, study the earliest stars and galaxies, and seek out strange new planets around distant stars. NASA built the space telescope in two parts: the telescope itself and a huge, complicated sun shield that will protect the observatory's sensitive instruments from the sun. During a news conference today, Lightfoot was joined by Thomas Zurbuchen, associate administrator of NASA's Science Mission Directorate, as well as Dennis Andrucyk, deputy associate administrator for the directorate, to describe the causes of the delay and the steps they're taking to push the project forward. While all flight hardware is complete, they said, testing of some parts of the hardware has taken longer than expected; for instance, rather than taking two weeks to deploy for the first time and a month to fold and stow, the sun shield took a month to deploy and two months to fold and stow. There have also been schedule delays due to hardware mishaps: The cables that pull the sun shield into place had too much slack, leading to a snagging hazard and seven small tears forming within the shield's five independent membranes; the largest two were 4 inches (10 centimeters) across, Andrucyk said. In addition, "primarily in the propulsion system, we've had a schedule delay due to a transducer that was incorrectly powered; we needed to replace that. That resulted in a three-month hit," he added. "An incorrect solvent was run through the prop[ulsion] system; as a result, we wound up having to replace valves in that system, and a catalyst bed heater was accidentally overstressed and needed to be replaced. Those [issues] are avoidable errors, but in developing very complex systems, those things do happen." NASA originally hoped to launch the James Webb Space Telescope in 2018 but delayed it until 2019 last September due to delays in the observatory's assembly. 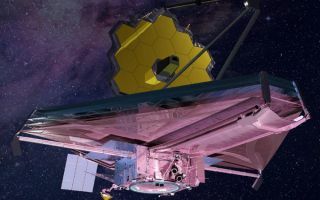 The potential for more issues arose in February, when a report from the U.S. Government Accountability Office warned that the telescope faced a high probability of more delays that could push the telescope beyond its budget cap. In 2001, Congress assigned the telescope a cost cap of $8 billion prior to launch. "Following data from an independent assessment, NASA has determined that the Webb launch date milestone will be delayed from its baseline by more than six months, and its development cost estimate might exceed the 8 billion [dollar] development limit," Lightfoot said at today's news conference. "If we breach the 8 billion cost that was laid out in the congressional appropriations, the project will need to be reauthorized by Congress." Officials are still reviewing the possible cost increase, but NASA will submit a detailed report to Congress this summer about the impacts to the cost and schedule. When the James Webb Space Telescope finally flies, it will be the largest space observatory ever launched. The observatory has seven times the light-collecting power of Hubble. It will operate at ultracool temperatures and be able to detect infrared light from the universe's earliest stars and galaxies, as well as analyze the atmospheres of distant planets as they pass in front of their stars. The assembled instruments and mirrors recently completed testing in an enormous cryovacuum chamber at Johnson Space Center in Houston, and the telescope was transported to Northrop Grumman's facility in California for final assembly with its tennis-court-size sun shield and spacecraft bus. The NASA officials specified organizational changes in work on the telescope, including implementing more NASA oversight of the project at Northrop Grumman. NASA will track daily and weekly test reports, and officials from NASA's Goddard Space Flight Center in Maryland will rotate into the facility in California to help oversee integration and testing. The technical processes and procedures will also be reviewed, to ensure a high confidence level of the telescope's success at launch. NASA is also establishing an independent review board to assess the deployment sequence and other aspects of the project's launch. In the meantime, engineers are implementing fixes to the specific hardware issues, such as adding springs to the sun shield's cables to keep them from developing slack during the shield's deployment. "Webb will journey to an orbit about a million miles from the Earth — four times further than the moon," Zurbuchen said at the news conference. "Simply put, we have one shot to get this right before going into space. You've heard this before, and it rings true for Webb: For us, really, failure is not an option ... It needs even closer attention now as it nears the finish line." The upcoming launch of NASA's Transiting Exoplanet Survey Satellite, and possible collaboration between the Hubble Space Telescope and Webb for deep-space science, should not be affected by the delay, officials said. Editor's note: This story has been updated with more details from a NASA teleconference on the James Webb Space Telescope launch delay.